Welcome to Bon Appétit… Limerick’s first and only authentic French crêperie. Serving breakfast and lunch four days a week, Thusday to Sunday. Located inside the popular Milk Market in Limerick and surrounded by market stalls, cafés, cheese shop, the crêperie fills a missing element of french flair in the area. We offer an inviting menu of mouth watering crêpes ( sweet ) and galettes ( savoury ), delicious tartiflettes and omelettes, plus a choice of soups and juices. Using both traditional and buckwheat flour, our crêpes are as authentic as any you would eat in Brittany. Bon Appétit ingredients are hand picked from fresh, local, free range produce to ensure that our crêpes and galettes are the tastiest crêpes around.Our crêpes are our greatest asset, we have developed what we believe is the perfect batter for producing paper-thin crêpes. Sebastien Ridoux and Kasia Wiacek are the owners/operators. Sebastien is a Frenchman who, as a child, loved the crêpes his grandmother from Brittany cooked for him. After arriving in Limerick in 2003, and with the experience of having worked in the restaurant industry for many years, he set up Fleur De Sel (now Bon-Appétit Crêperie) gether with Kasia. 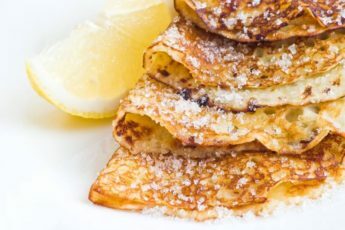 Kasia is a food lover and an expert when it comes to exploring and creating innovative crêpe recipes. Balanced with perfection, sweetness and savour, the crepes from Bon-Appétit Crêperie have proved an ever-popular treat for Milk Market fans for many years. Guided by the mantra that “crêpe-making is painfully remiss without superb customer service and meticulous, individualized attention”, Kasia and Sébastien are inspired by quality ingredients, variety and the unique beauty found in fine European edibles and elixirs. “Our crêpes are our greatest asset” says Sebastien. “We use fresh ingredients and keep a huge selection of spices and condiments in our shop kitchen. We pride ourselves on the authenticity and quality of our cuisine”. At the shop you will find the following mouth-watering crepe varieties… Parisian (with chocolate sauce), Angélique (banana & chocolate), Acadie (banana & maple syrup), Crêpe Suzette (Grand Marnier, sugar and butter) and Amélie (apple and cinnamon). Complemented with a range of Bretton foods cooked on site in enormous Paellera dishes, Bon-Appétit Crêperie will leave your taste buds on high alert.